This year, the Easter Bunny got fancy and did his shopping at QUIN, an indie jewel-box of a candy shop located in Portland’s hipster haven and un-mall, Union Alley. Actually, I believe they call it a “shopping arcade.” Very Portlandia. Maybe the Easter Bunny knew I was trying to keep the high fructose corn syrup factor to a minimum this year. Or maybe he knew I was trying to emphasize quality over quantity at our house. Either way, he did me a solid by picking up treats that are made by hand — and, according to the QUIN website, using “the best ingredients we can get our hands on.” This means real Oregon strawberries for the gumdrops and Oregon coast harvested Jacobsen sea salt for the caramels. And cherry puree for the Cherry Gummy Eggs. On Easter, I got to try a few of these beauties and I can tell you they are delightful. I had forgotten how much I love cherry candy — reminiscent of the beloved cherry Lifesavers of my youth. But with Easter over, I know that these treats are best when enjoyed occasionally. Sparingly, even. Sugar is addictive — with some research finding it to be eight times more addictive than cocaine. Knowing this — and acknowledging my own relationship to sugar — I’m glad the Easter Bunny didn’t leave a boatload of Cherry Gummy Eggs. I’m glad I don’t live or work close to QUIN, which would make supporting my habit all too easy. And I’m glad I can get my cherry fix with my new favorite breakfast, the Cherry Lemon Smoothie. This smoothie is still a bit of an indulgence — it’s not as healthy as a low-sugar green smoothie or a green juice without fruit. That’s what this smoothie is all about — it still has plenty of protein, fiber, and healthy fats while satisfying your craving for a little sweet. 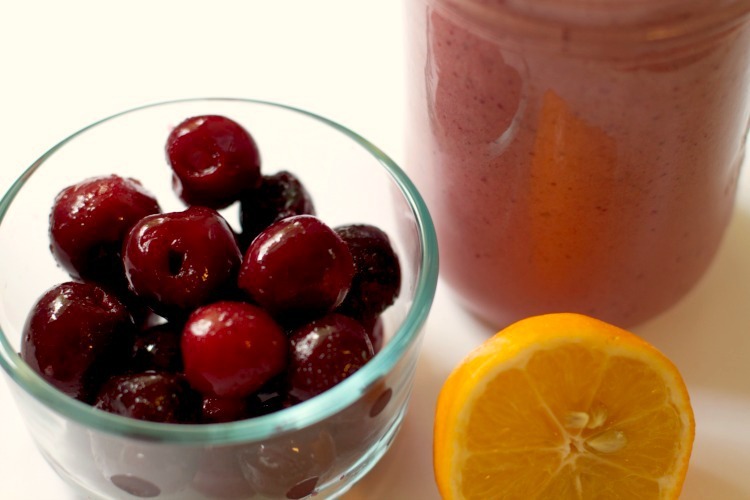 I’ve used a combination of cherries and cranberries here — both are high in Vitamin C, plus the cranberries are low in sugar and provide extra antioxidants and phytonutrients that fight cancer and inflammation. If you’re transitioning from more of a standard American diet, feel free to add the banana for sweetness. If you have blood sugar issues such as pre-diabetes, or are minimizing your sugar intake, you can leave the banana out and enjoy a tart version of the smoothie. I think both versions are delicious in their own way. Place ingredients into high speed blender, adding ice last. Process until creamy and smooth. Add water a quarter-cup at a time if you want a thinner consistency. Serve immediately or store some in fridge for later. Salud! What’s your favorite smoothie these days? What are your favorite flavors and combos? Please leave a comment below — I’d love to hear from you! Note: I learned about combining cranberries and walnuts into a smoothie while doing Dr. Mark Hyman’s “10-Day Detox Diet.” You can read about my experience on that detox here. This sounds amazing. I’m definitely going to try it. Thanks, Monica. I’m intrigued by the lemon with rind. I think you’ll like that lemon rind — definitely gives it a little kick. 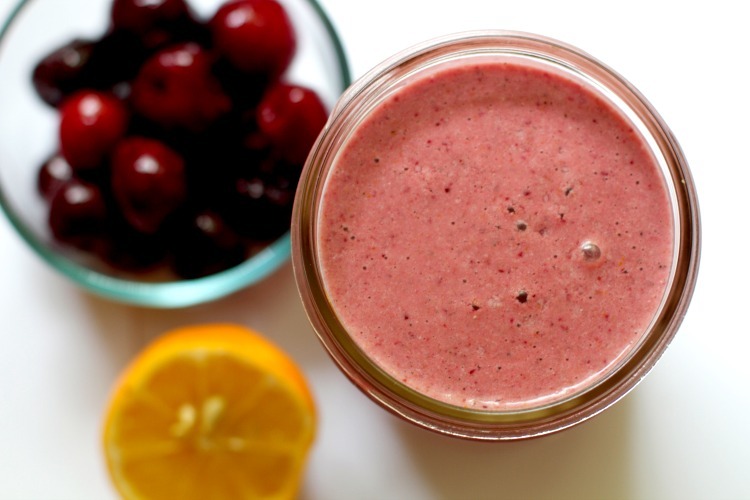 And great to add if you’re in a rut with your usual smoothies. Have fun!